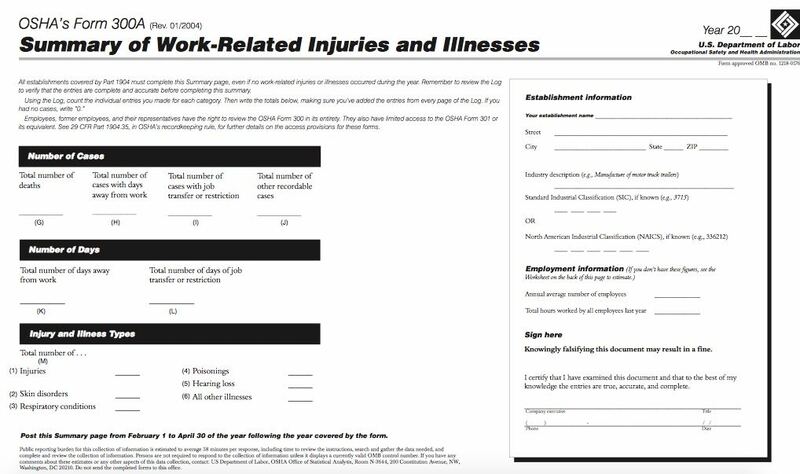 It’s that time of year when employers with 10+ full-time employees in certain industries are required to post record of all reportable worksite injuries/illnesses that need treatment beyond first aid that occurred on the worksite during the prior year. The complete record is maintained on their OSHA 300 logs (page 7 of the OSHA 300 booklet) and includes details such as where and when the injury occurred, the nature of the case, the job title of the injured employee, and the number of work days missed (or on light duty) due to the work-related illness or injury. When and where should OSHA 300A Summaries be posted? A significant injury or illness diagnosed by a physician or other licensed healthcare professional. Even if no injuries occurred in the previous year, employers are required to post the summary to meet the requirements of this law. Does the OSHA 300A Summary also have to be submitted online? When should employers submit their OSHA 300A Summary online? The deadline for submitting the OSHA 300A Summary online is March 2, 2019. OSHA has created an online, secure Injury Tracking Application system for employers to submit their information. Will Stratus.hr submit the OSHA 300A Summary online for me? If Stratus.hr administers your workers’ comp policy AND your company is required to comply because of industry and size, Stratus.hr will also submit your data. (You’ll receive notification from Stacey Gibson when it is completed.) Clients that administer their own workers’ comp policy will need to submit their information via the OSHA Injury Tracking Application. Should you need assistance, please contact your Stratus.hr Representative prior to Feb 15, 2019. Please contact us at HR@stratus.hr for more information on this or other OSHA-mandated regulations. Employers must post last year’s OSHA Summary log from Feb 1 – Apr 30, as well as submit the summary details to OSHA online by March 2, 2019.